Alternatively, you can get the standalone version without installer or auto-updates. If you're not sure which version to get, you probably want the one up above. Digital Squire beta screenshot. Click to enlarge. Digital Squire aims to be a replacement for character sheets at the gaming table. 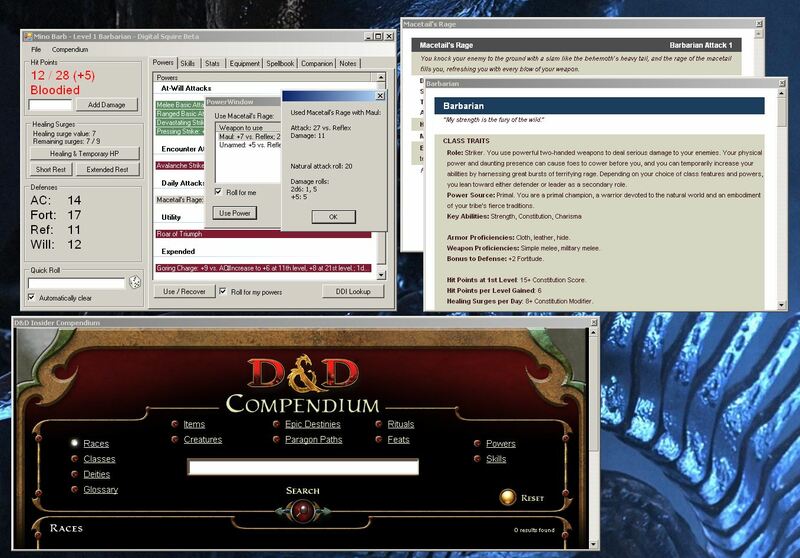 It features tight integration with D&D Insider tools, including the Compendium and the Character Builder. Includes a dice roller which will optionally make your attack and damage rolls for you. At the end of the session, save your character and load it again next time. No more forgetting how many action points or healing surges you had left, or which daily powers you've expended! Do I need to be a D&D Insider subscriber to use Digital Squire? No, although you'll get more out of it if you are. Digital Squire does use the files from the Character Builder to load characters, but you can download the free preview of the Character Builder which will let you make characters of up to third level. 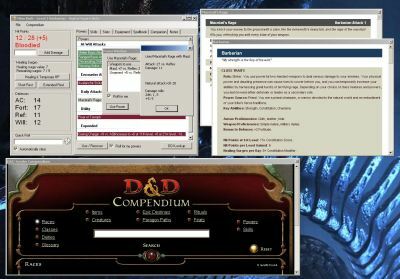 On top of that, the Compendium functionality requires an active DDI subscription. If you're having troubles, make sure you've got the .Net framework version 3.5 installed. To download it from Microsoft, 3.5. Get .Net 3.5 here. Windows Vista users, you only need to get the .Net Framework 3.5. Version 3.0 is already included in Vista. Please send any feedback at all to itoltz@gmail.com. If you don't report a bug, I probably won't know about it. If you don't suggest a feature, I probably won't think of it on my own. So send me an email and help me make this program better!